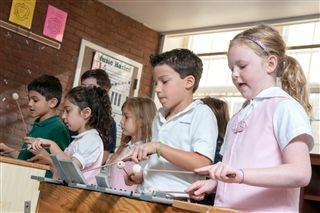 Students in the Lower School enjoy many opportunities to explore the visual arts, fine arts, painting, drawing, drama, dance, choral and instrumental music — both in and out of the classroom. Students share their creative talents with the Elementary School community at several occasions throughout the year, including annual concerts and special assemblies. Visual art for elementary school children is like breathing. Because of this natural inclination, students in grades K-6 are introduced to a variety of media. They use paint, clay, plaster, fabric of different kinds, paper, and glass, etc. All children in our coed K-6 elementary school use these materials to learn all the key principles and elements of art. Through many different art activities they master the skills to practice these principles as well as to feel comfortable with the media and tools they use. Art appreciation and aesthetics are taught to aid the student artist in personal expression. While viewing the works of artists from different periods of history and also from different cultures, our children learn a rich aesthetic vocabulary, sensibility, and knowledge to critique their own work. Some of the artists we study in depth are Leonardo da Vinci, Georgia O’Keeffe, Vincent van Gogh, Faith Ringgold, Wayne Thiebaud, Maria Martinez, René Magritte, Paul Klee, etc. The cultures and periods of history covered are also varied. In any given year, classes can travel in their aesthetic journey from Prehistory to the Renaissance — from West Africa to Ancient Greece and Maya civilization. 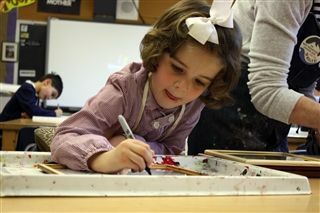 Emphasis is also placed on blending the students’ academic curriculum with the work they are creating in the art studio. The fourth grade does an extensive study of the Lenape in Social Studies while in art they are learning art traditions of many different Native American tribal groups. By participating in the creative process, our young artists decide what they want to do, select the appropriate material, and design ways to complete their projects. During the Spring Arts Festival, student artists proudly display their artwork in an art show in Bonaventura Hall. All are invited to this culminating and celebratory event. The drama studio, with its miniature stage, is a lively place! In creative drama classes, the elementary school boys and girls explore, enjoy, and share new ways of self-expression through movement, pantomime, storytelling, puppetry, improvisation, and small and large group performances. The folklore of many countries provides the core curriculum for the primary grades. Middle graders receive formal instruction in puppetry and create their own puppet shows. All grades participate in creative dramatics throughout the year and are involved in the creation of their own videotaped commercial, which is self-developed. In the intermediate grades, these commercials are also self-written, directed, and produced! Throughout the year, the children are given numerous performance opportunities that develop public speaking, self-confidence and poise. In the winter and spring, the students celebrate their talents in both our Christmas and spring concerts. For those especially interested in creative dramatics, our After-School Adventures has many popular offerings for children of all ages and talents. Recent performances by this group have included "Annie" and "Willy Wonka and the Chocolate Factory." Elementary school students participate in a general music class of active music making, and in an age-appropriate chorus. Classroom music uses a variety of methods to feed and expand the student’s individual music skill. The Orff Schulwerk is an approach, in which children sing, move, and play pitched (xylophones, glockenspiels, metallophones) and unpitched (drums, shakers, metals) percussion instruments. The Carol Krueger methodology of melodic and rhythmic reading is used for theory and tonal memory. All classes will have a kinetic unit of World Drumming, which enhances the skills of focus, listening, group participation and improvisation. Students in grades 2, 3, and 4 have a unit in playing the recorder. The music curriculum for all grades includes hands on support of classroom IPads for reinforcement of music skills and creativity in composition. Children in kindergarten through second grade participate in dance classes where they develop basic movement skills and body awareness through artistic expression. In our dance studio, students experience and appreciate different forms of dance and music: ballet, modern and jazz. 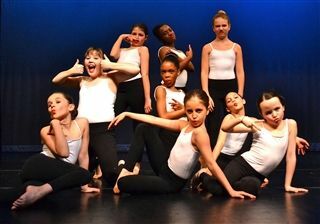 Additionally, our young dancers develop theatre skills and etiquette. Girls in grades 4 to 6 are invited to participate in the Dance Apprentice program with the middle and high school dancers. The apprentices participate in formal classes in ballet, modern, and jazz, and perform twice a year within the Upper School Dance Concert performances. Beginning in grade 4, students may choose to take instrumental music. Instruments taught include cello, clarinet, drums, flute, saxophone, trombone, viola, and violin. Our instrumental music students perform for the community twice a year. 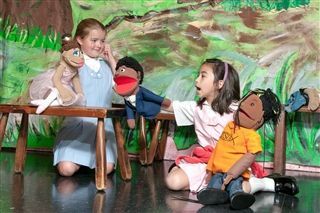 In creative drama classes, the children explore, enjoy, and share new ways of self-expression through movement, pantomime, storytelling, puppetry, improvisation, and small and large group performances.